Posts related to solar power and offgrid living. Success! 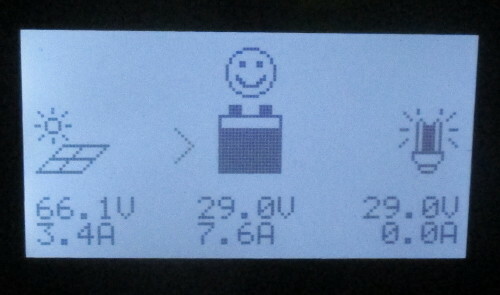 I received the Tracer4215BN charge controller where UPS accidentially-on-purpose delivered it to a neighbor, and got it connected up, and the battery bank rewired to 24V in a couple hours. Only took a couple hours to wire up and mount the combiner box. Something about larger wiring like this is enjoyable. So much less fiddly than what I'm used to. And the new PV array is hot! Update: The panels have an open circuit voltage of 35.89 and are in strings of 2, so I'd expect to see 71.78 V with only my multimeter connected. So I'm losing 0.07 volts to wiring, which is less than I designed for. 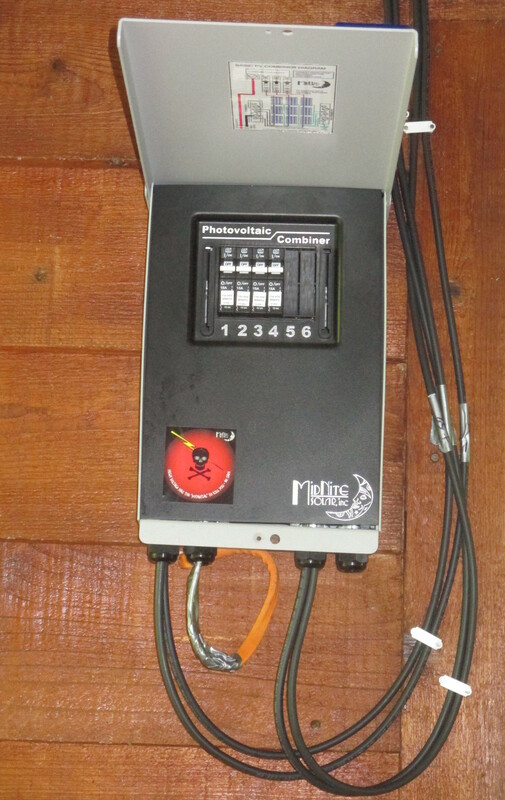 I've installed 1 kilowatt of solar panels on my roof, using professional grade eqipment. 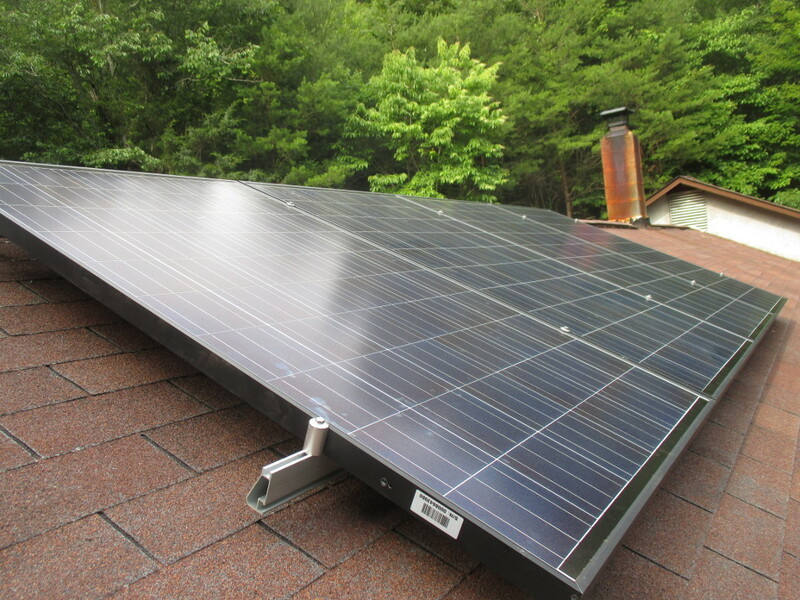 The four panels are Astronergy 260 watt panels, and they're mounted on IronRidge XR100 rails. Did it all myself, without help. Cheap but sturdy. Total cost will be under $2500. It would probably cost at least twice as much to get a professional install, and the pros might not even want to do such a small install. Learn the roof mount system. I want to be able to add more panels, remove panels when working on the roof, and understand everything. Make every day a sunny day. With my current solar panels, I get around 10x as much power on a sunny day as a cloudy day, and I have plenty of power on sunny days. So 10x the PV capacity should be a good amount of power all the time. 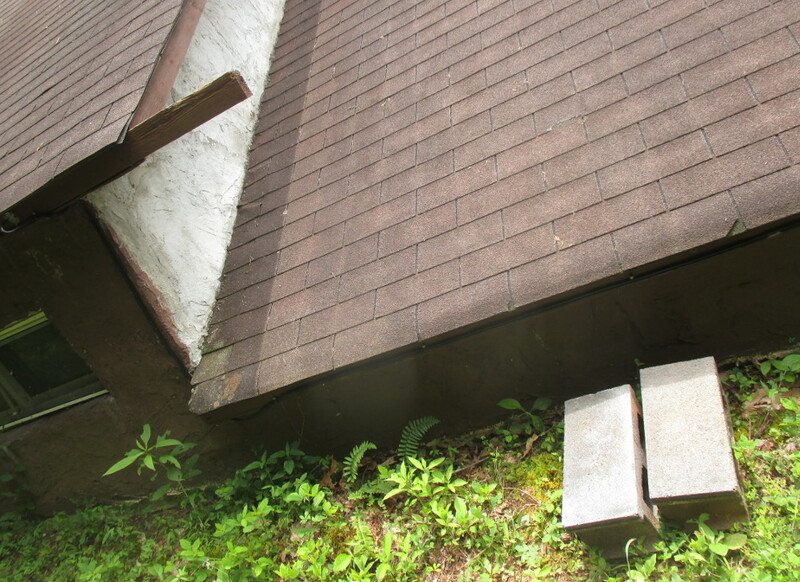 My main concerns were, would I be able to find the rafters when installing the rails, and would the 5x3 foot panels be too unwieldy to get up on the roof by myself. I was able to find the rafters, without needing a stud finder, after I removed the roof's vent caps, which exposed the rafters. The shingles were on straight enough that I could follow the lines down and drilled into the rafter on the first try every time. And I got the rails on spaced well and straight, although I could have spaced the FlashFeet out better (oops). My drill ran out of juice half-way, and I had to hack it to recharge on solar power, but that's another story. Between the learning curve, a lot of careful measurement, not the greatest shoes for roofing, and waiting for recharging, it took two days to get the 8 FlashFeet installed and the rails mounted. Taking a break from that and swimming in the river, I realized I should have been wearing my water shoes on the roof all along. Super soft and nubbly, they make me feel like a gecko up there! After recovering from an (unrelated) achilles tendon strain, I got the panels installed today. Turns out they're not hard to handle on the roof by myself. Getting them up a ladder to the roof by yourself would normally be another story, but my house has a 2 foot step up from the back retaining wall to the roof, and even has a handy grip beam as you step up. The last gotcha, which I luckily anticipated, is that panels will slide down off the rails before you can get them bolted down. This is where a second pair of hands would have been most useful. But, I macguyvered a solution, attaching temporary clamps before bringing a panel up, that stopped it sliding down while I was attaching it. I also finished the outside wiring today. Including the one hack of this install so far. 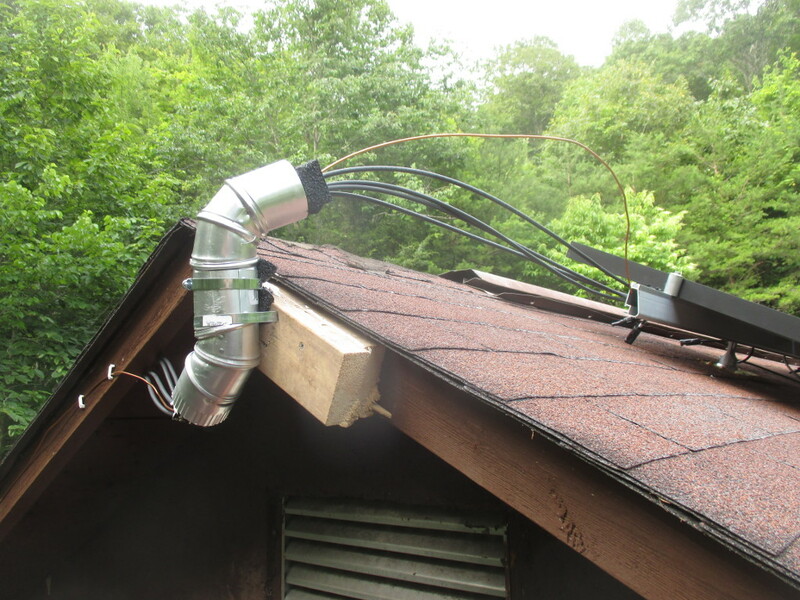 Since the local hardware store didn't have a suitable conduit to bring the cables off the roof, I cobbled one together from pipe, with foam inserts to prevent chafing. While I have 1 kilowatt of power on my roof now, I won't be able to use it until next week. After ordering the upgrade, I realized that my old PWM charge controller would be able to handle less than half the power, and to get even that I would have needed to mount the fuse box near the top of the roof and run down a large and expensive low-voltage high-amperage cable, around OO AWG size. Instead, I'll be upgrading to a MPPT controller, and running a single 150 volt cable to it. Sun is setting after 7 (in the JEST TZ); it's early spring. Batteries are generally staying above 11 volts, so it's time to work on the porch (on warmer days), running the inverter and spinning up disc drives that have been mostly off since fall. Back to leaving the router on overnight so my laptop can sync up before I wake up. Not enough power yet to run electric lights all evening, and there's still a risk of a cloudy week interrupting the climb back up to plentiful power. It's happened to me a couple times before. Soon, 6 months of more power than I can use.. Falling off the cliff is always a surprise. I know it's there; I've been living next to it for months. I chart its outline daily. Avoiding it has become routine, and so comfortable, and so failing to avoid it surprises. Monday evening around 10 pm, the laptop starts draining down from 100%. House battery, which has been steady around 11.5-10.8 volts since well before Winter solstice, and was in the low 10's, has plummeted to 8.5 volts. With the old batteries, the cliff used to be at 7 volts, but now, with new batteries but fewer, it's in a surprising place, something like 10 volts, and I fell off it. Weather forecast for the week ahead is much like the previous week: Maybe a couple sunny afternoons, but mostly no sun at all. Falling off the cliff is not all bad. It shakes things up. It's a good opportunity to disconnect, to read paper books, and think long winter thoughts. It forces some flexability. I have an auxillary battery for these situations. With its own little portable solar panel, it can charge the laptop and run it for around 6 hours. But it takes it several days of winter sun to charge back up. That's enough to get me through the night. Then I take a short trip, and glory in one sunny afternoon. But I know that won't get me out of the hole, the batteries need a sunny week to recover. This evening, I expect to lose power again, and probably tomorrow evening too. Luckily, my goal for the week was to write slides for two talks, and I've been able to do that despite being mostly offline, and sometimes decomputered. And, in a few days I will be jetting off to Australia! That should give the batteries a perfect chance to recover. My house entered full power saving mode with fall. Lantern light and all devices shutdown at bedtime. But, it felt early to need to do this. Comparing with my logbook for last year, the batteries were indeed doing much worse. I had added a couple of new batteries to the bank last winter, and they seemed to have helped at the time, although it's difficult to tell when you have a couple of good batteries amoung a dozen failing ones. Tried as an experiement disconnecting all the bridges between the old 6v battery pairs. I expected this would mean only the new 12v ones would be in the circuit, and so I could see how well they powered the house. Instead, making this change left the house without any power at all! On a hunch, I then reconnected one bridge, like this -- and power was restored. My best guess of what's going on is that the wires forming the positive and negative rails are not making good connections (due to corrosion, rust, broken wires etc), and so batteries further down are providing less and less power. The new 12v ones may not have been able to push power up to the house at all. 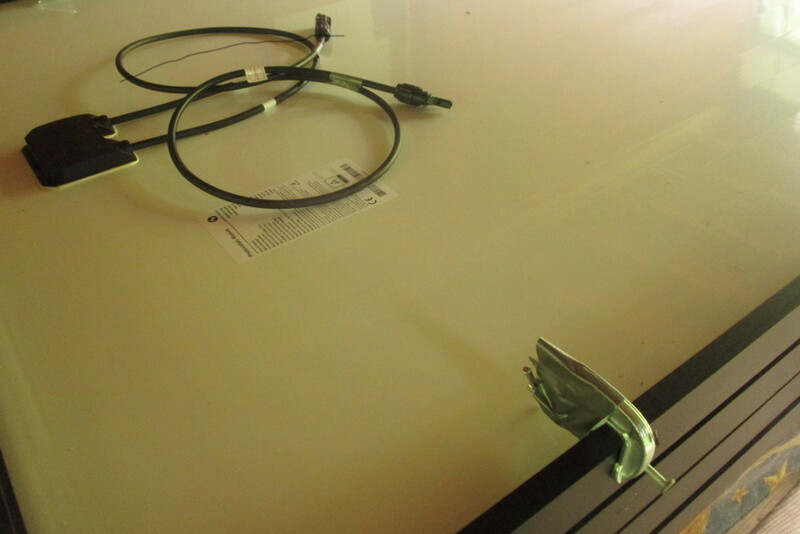 So got longer cables to connect the new batteries directly to the house, bypassing all the old stuff. That's working great -- house power never dropped below 11.9v last night, vs 11.1v the night before. The old battery bank might still be able to provide another day or so of power in a pinch, so I am going to keep them in there for now, but if I don't use them at all this winter I'll be recycling them. Astounding that those batteries were in use for 20 years. With days beginning to shorten toward fall, my house is in initial power saving mode. Particularly, the internet gateway is powered off overnight. Still running electric lights until bedtime, and still using the inverter and other power without much conservation during the day. September/October is the tricky time where it's easy to fall off a battery depletion cliff and be stuck digging out for a long time. So time to start dusting off the conservation habits after summer's excess. I think this is the first time I've mentioned any details of living off grid with a bare minimum of PV capacity in over 4 years. Solar has a lot of older posts about it, and I'm going to note down the typical milestones and events over the next 8 months. Entered in 6 months of the house's solar power data. When I last did in mid-December I was seeing the expected slow decrease, but did not anticipate the dip in mid-January, which I think was due to snow and bad weather. 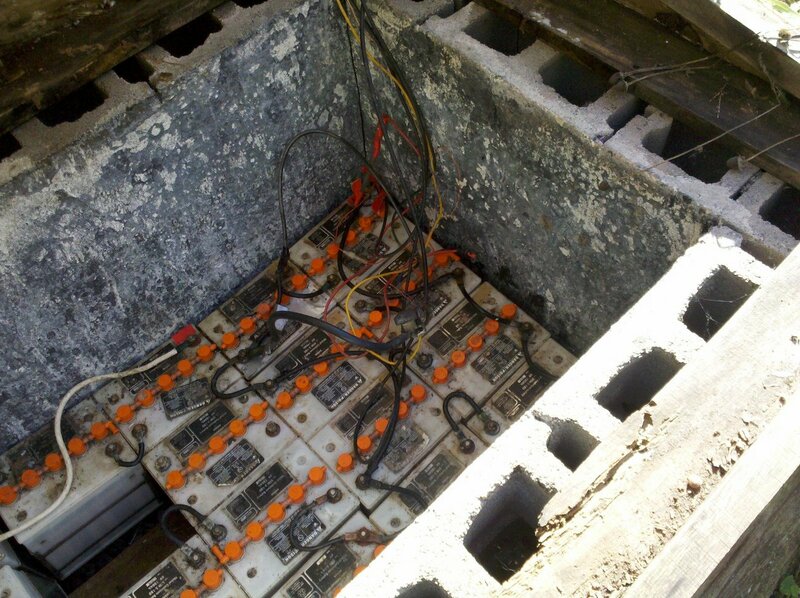 At the end of February, I doubled the size of the active battery bank, and this damped out many of the spikes and lows. The mid-April low is bad weather paired with much higher than usual (24x7) inverter use, and possibly with some batteries that were still being conditioned after spending all winter off power. I'd expect the last couple of months to be higher, but perhaps I'm just not needing to conserve power here at all (come to think, I have a radio, an inverter, a flourescent light, an electric shaver charger, a sheevaplug, a laptop, and 4 USB pepherials going right now). I'm surprised to be on the porch hearing rushing water. I tend to think of up here as high and mostly dry, but not this time of year. Yesterday was such a soaking rain, very annoying at the time as I did chores and drove out from town. Now there are two little creeks here. That's a sound I've missed.. Pity that all the water is going to waste. I discovered the reason the large cistern is not filling up is simply because the pipe into it is not connected to the feeder pipe in the spring. It seems like a complete shambles really, with layer upon layer of pipes, all broken. I will have to wait until the water is down to dig and find out what's going on, and fix it. In the last of the evening light today I got the house's two battery banks finally combined into one bank. I had planned this out long ago, and bought one long cable I'd need, so was surprised to find I needed two long cables. Had to slide batteries around like a big sokoban puzzle, and swap several cables to make it work. While I was away I'd charged up the bank that had gone unused most of the winter. So they were near equalized and the combination seems to have gone ok. I got through the lean part of the year with only half the batteries; there never seemed to be a good time to combine them. 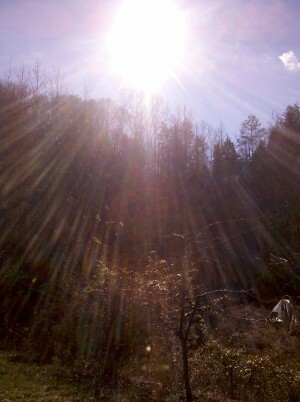 It remains to be seen if the solar panels can keep my increased capacity filled. I hope this was only an early taste of spring. Would be nice to have some more icy weather so I can put off dealing with refrigeration a little while longer. I have my eye on a 12v/propane fridge. It's been an intense couple of days out at the Hollow. Did it only start to snow yesterday? It feels like a long time in winter. Yesterday was the first day that the solar panels produced no power, it was too cloudy and snowing most of the time. I cleaned an inch of slushy snow off the panels to no avail, and wondered if the power would last. But the wood stove has kept it nice and warm, so yesterday was spent cosily in the living room enjoying the snowfall, nethack, and podcasts. Also, I'm very much enjoying cooking on the wood stove. I've never been in a position to cook on one before; when I lived at Wortroot the stove was in the cabin, and the cold kitchen in a different building. So cooking on the stove, or even keeping a kettle on, was mostly only done in emergencies. Here, I am constantly using it, and the propane stove is still on its first 20 pound tank. Long slow cooked beany or roastish stuff does especially well. Yesterday I did a great pork loin roast with homemade quick sauerkraut. Today, after cleaning another 3 inches of snow off the solar panels, and scraping off a layer of ice, I am getting a decent amount of power for a cloudy day with some snow still falling. Turns out it was good I cleaned them yesterday after all, since a part I missed has a inch+ layer of hard ice, which I don't dare chip away at for fear of damaging the panels. I'd not want to live someplace where it snowed a lot with solar panels that didn't have some kind of a heating system. I wish I had a camera to show the long walk down the driveway, through the winter woods, and past the field where the wind blows gusts of snow into the air. But my cell phone is on a Caribbean cruise. 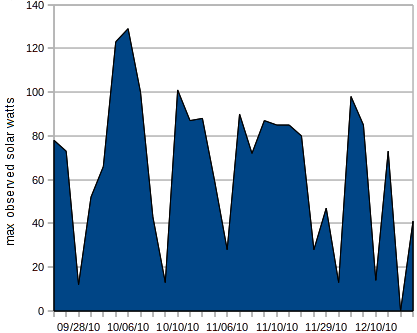 I have been recording data ever since the fall equinox, and it's almost to the winter solstice now. Time to geek out with some graphs! Solar production has surely been falling off with the waning days, but it seems like it will get through the shortest day with enough, and from then on, no worries. Highest watt production seen each day I've been here. Charge controller limits it to a maximum of 15 volts during the day. Originally, it was limiting it to 13 volts. I've always loathed cheap particle board and peg bookcases, and when I broke one while reorgaising the living room at the Hollow today, I finally found a good use for them. They're great fun to chop up with an axe, and make for a very hot fire in the stove later. I released git-annex 0.03 today. The main improvements are being able to configure the backend to use on a per-extension basis in .gitattributes, a fsck subcommand that will find dangling annexed content, and bugfixes, including massive memory use savings. The big feature under development next is an idea Josh Triplett and I batted around; a way to checkout annexed files to edit their contents. Today I also got the radio working well here. Set up a car radio with a 40 foot wire for an antenna, and I finally got it almost static free. Pity that running a nslu2 on the same power circuit causes interference, so I am not able to use that to feed in music via the radio's AUX jack yet, which is the eventual plan. And the radio's powered USB outlet is wasted, I had hoped to run the nslu2 from that. Seems I can run the radio for 9 hours and still have plenty of solar power, even this time of year. I brought my cat Leo to the house in the hollow a week ago. He settled in quickly; this was his 7th move. He seems both more kittenish, and more predatory out here. This was a trial run, I'll bring him back to town soon for a few weeks. Since early August, I've for one reason and another been away every other week, and I got tired of worrying about the cat home alone. With a cat, and with electricity seemingly sorted, it's getting homelike here. As the days shorten, I'm being power wasteful with computers and radio and lights, and the batteries still never drop below 13.5 volts. Bodes well for winter. All that remains to be done is refrigeration that does not involve hauling ice, and more water. Winter will help with both. Still remains to be seen if I will continue bouncing back and forth, or if there will be an inflection point. I've regained a tranquility that had been eluding me for ages. It's been a lot of work, but it seems worth it. 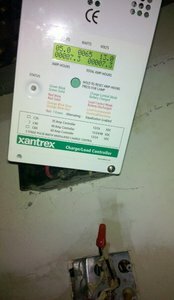 As planned I have installed the Xantrex C-35 charge controller in the offgrid house. This was a bit of an adventure..
First I had to wait around in town all day for the UPS man to deliver the thing. Of course he didn't until 4, so by the time I got over to the house it was almost dusk. Further delayed by necessary visiting with the nearest neighbor (a country thing), who claims there are "panthers" up this holler.. So by the time I was ready to work, it was nearly too dark. 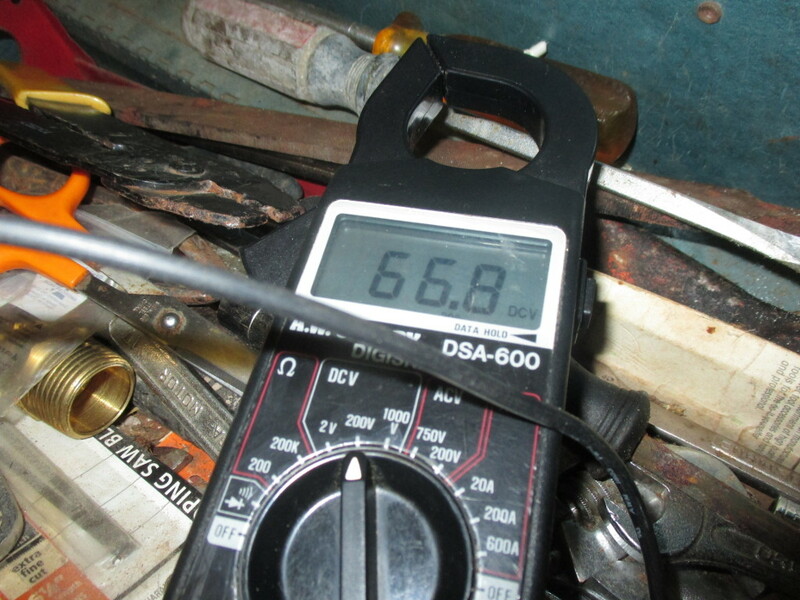 First I checked the battery bank which I had left charging for a week without a controller or backflow diode. It had gained only half a volt (to 10.5v), so now I knew I really did need the controller in order for the sun to work for me while I am away. Then, barely able to see, I swapped that bank to provide house power. By 10 pm, using just my laptop, I'd drained 1.5 volts from it and it was as low as it should go. I had 4 hours of laptop battery. This was a bit of a problem since I tend to stay up until 3 am on it. Instead, I spent 2 hours, by kerosine lantern light, exposing, tracing, and testing wiring. I was able to find 2 wires that were clearly going to the battery bank and had current, and 2 others that were labeled as going to the panels, and, in the dead of night, had no current. Great, I thought, that's the wires I need, let's hook up the controller.. The problem with doing all that stuff at midnight is it took me quite a long time to wind down. I normally start winding down at 10 am and get to sleep at 3. Last night I got to sleep at 5. My four hours of battery for my laptop were nursed all hours through the night. Mostly thanks to powertop and the improved power saving of the kernel these days. And to not having wifi or anything enabled. I do wonder if my recent use of redshift to redden the screen causes the it to use less power at night, as I have never gotten five hours out of this laptop before. Anyway, to get the controller hooked up to the PV array and actually charging the batteries, I ended up having to rip lots of wiring out of the wall, until I simplified the mess to something I could understand. And at the moment I've bypassed the PV array's breaker, which is certainly a safety hazard. So more wiring to do, but I did get it working. 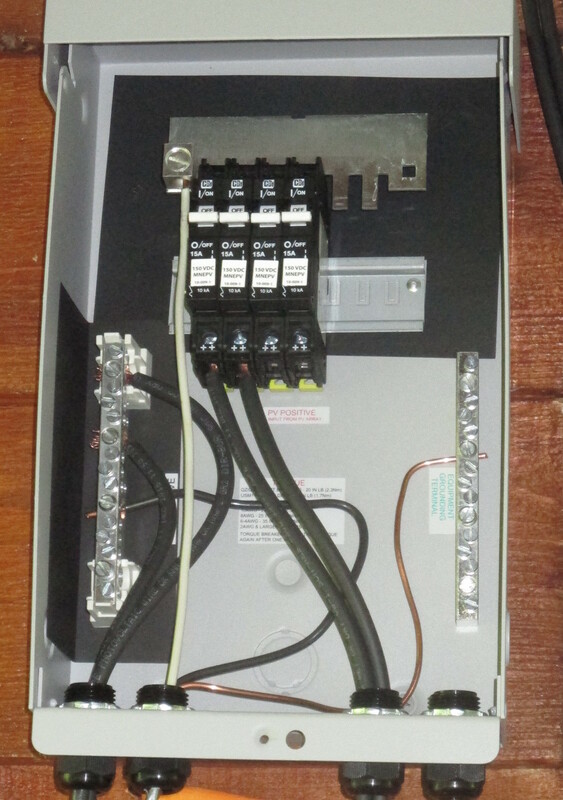 Finally, I hooked the house wiring up to the same battery bank that is being charged from the panel. This house had been using a 2 battery bank setup, because without a charge controller to moderate the PV voltage (17-25 volts), you can't also connect a load that expects 12 volts. The charge controller fixes that problem. The other battery bank is sitting unused for now. Later, I will equalize and connect the two, in order to get one large(ish) battery bank. 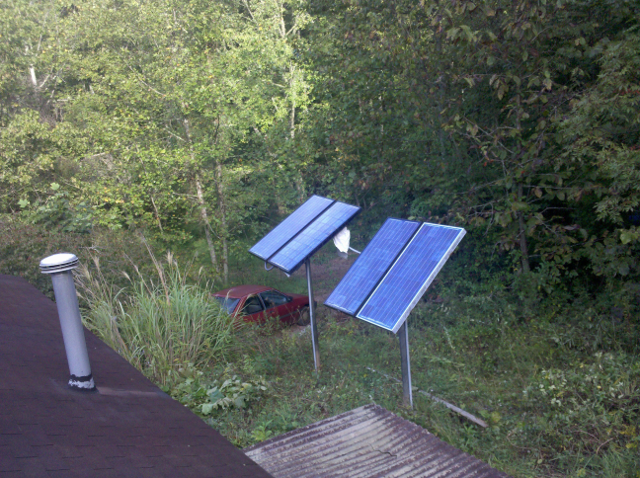 Now, during the sunny fall daytime, I can use all the power I want; it's free from the sun. Battery bank shouldn't drain at all when I use power during the day, and the controller should charge them up and keep them topped off, so they'll be there for me at night. Now to verify that it's working like it's supposed to! (I posted some documents and more thoughts from this here). I'm back in town. After approximatly 4 full days of use, the first battery bank dropped to 9 volts, my cutoff point for safe use. Which turned out to be below the safe use point of my laptop power adapter, which burnt out while I was busy listening to music and adding power-saving caching stuff to my mpd setup. Irony not appreciated, world. I decided to come back while the other bank is still relatively full. Hurrying downtown to grab lunch in between work on Branchable, I noticed it was a beautiful sunny day, and I realized that this makes such days even better, because besides enjoying them, I know I'll be enjoying the yield on chilly nights sometime later. Well, in theory. Actually, the very antique charge controller in the house was dead and bypassed, so I removed it. I called its manufacturer wondering if it could be refurbished, but they suggested it belonged in a museum. So I've ordered a new controller, a Xantrex C-35. Until that comes, pretty days like today will charge, or possibly over-charge the batteries, which will then drain back out at night. Typically that's easy to achieve -- here it wasn't. 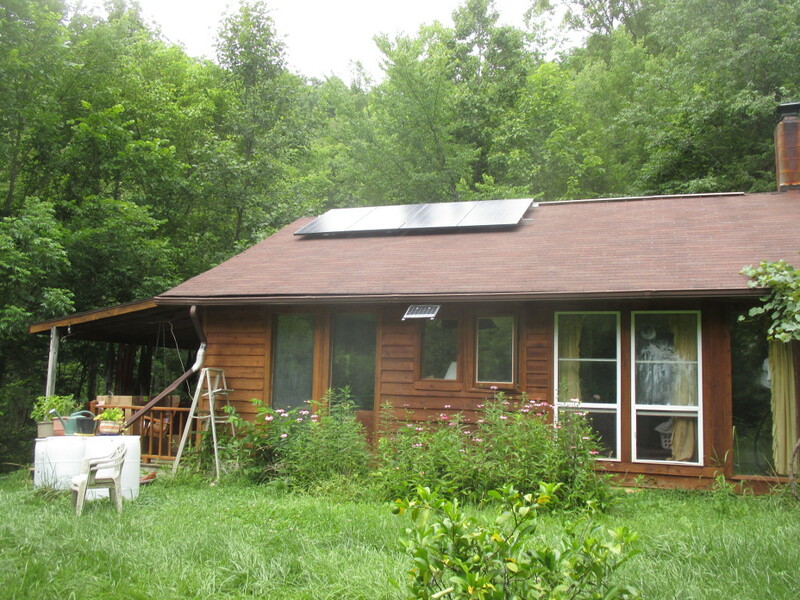 The house is solar powered, the only connection to the outside is a phone line. So I needed a computer that would work in that environment, using minimal (12 volt) power, and getting the most out of the limited bandwidth while providing those happy wifi bars. At DebConf we learned that the name for these little home servers we have been building for years is "FreedomBox". All right then, here's my latest FreedomBox build. A typical inexplicable tangle of computer bits. Computer: NSLU2. There are faster choices than the "Slug", but on dialup, speed doesn't much matter, and there are not many lower-powered choices. And with the NSLU2, I can take advantage of years of development and experience, that has resulted in great support for running eg, Debian on it, and deep available knowledge of hardware hacks. It's proven, cheap, highly reliable hardware, and I had it lying around. Wireless: ZyDAS 2501 USB dongle. Not my first choice, just one I had lying around. This device cannot run in AP mode. It is, by the way, possible to use some USB dongles in AP mode with a modified hostapd, but the few I know that work are out of stock. No problem; this house won't have many visitors, and I can tell them the details for connecting using Ad-Hoc wireless mode. Storage: 64 gb thumb drive I had lying around. Hmm, last time I touched a NSLU2, I had only 1 gb drives lying around. Progress. Modem: My NSLU2 is modified to have an external serial port, so I can use an external modem if desired. 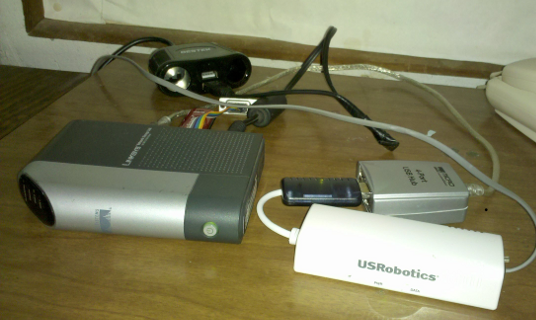 But I suspect a USB modem will use slightly less power, even though this third USB device means I need a USB hub too. I was doubtful about finding a USB modem dongle that works with Linux, but it was actually no problem, the USR5637 Just Works. Software: Debian Linux of course. For the first time I'm using the polipo web proxy cache, and it works marvelously on dialup and on this low-spec system. Combined with dnsmasq, this makes web browsing over dialup actually not painful. 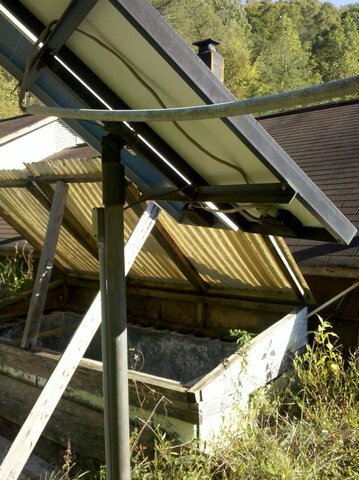 Since the solar house is in the sticks, the result is a server I call "stick". An old house, theoretically empty, but still filled with the cruft of its history. Here an old classroom-style pencil sharpener mounted on a wall. In a kitchen cabinet, a plastic bag of dried fish of unknown provenance. Old books. Somewhere, a moldering, out of tune piano. How does this make you feel? Maybe depressed, or urgently needing to wipe it all clean and repaint? Myself, as long as the previous inhabitants are people whose heads I don't mind getting into, I like this environment. I will carve out my own part of it, clean and reorganise that, but generally leave the rest as-is. It's weird that, if we were talking not about houses, but software, I'd probably bulldoze it down, compost it, grow trees from it, and start over. This house has the added complication of a solar power system that has accreted broken parts and workarounds over the years. So far I don't understand the original design, let alone what it developed into! I haven't been in this situation since spring of 2001. And then I only had to contend with no running water, and dialup. Now I also have to deal with limited power. Interesting times.